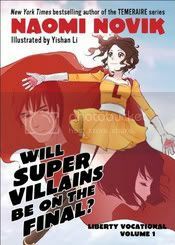 Title: Will Supervillains Be on the Final? As universities go, Liberty Vocational is the private college of choice for budding superheroes learning to master their extraordinary powers for the good of humankind. But for sixteen-year-old Leah Taymore, just making her way through classes without incident is shaping up to be a superhuman task. Star struck by legendary ex-hero turned student advisor Calvin Washington, petrified by ultrastrict dean Dr. Santos, and tongue-tied over her supercool (and handsome) classmate Paul Lyman, timid Leah fears that even her ability to manipulate atoms won’t be enough to survive the rigors of L.V.—and become a full-fledged defender of all that is right. But the real test of her mettle is yet to come, in the form of infamous supervillain Bane, who has infiltrated Liberty with a sinister plan to bring down the best and brightest heroes of tomorrow before they even take flight. Will Supervillains Be on the Final? is cute. Compared to Novik's Termeraire series, it seems to fall a little short for me, but that may be more of the fact that I don't think I'm entirely the target audience, but I can appreciate it for what it is. You can tell that Novik is having fun with her characters and their situations. Leah's goofiness fits her well as she tries to navigate through a life that is entirely new to her. The supporting cast can sometimes be a little over the top, but that's really the point. The book is done in a manga fashion (which lends itself very well to this story), so in my limited manga-reading experience this seems to be true to how they are written, so manga fans should really enjoy this. Yishan Li's art is crisp and clean, and easy to follow throughout most of the book. Novik's Temeraire fans (more the girls than the guys, although the questions of the morality of superheroics might prove to be interesting to the male set, too) should probably give this a try as well, just to see how Novik can stretch her writing muscles. Nothing challenging here, but something fun all the same. Federal regulations require that I disclose that I receive a small commission on any purchases made through Amazon links on my blog, which I use to purchase more books. Yeah, I think you should look into reading this. You'd probably enjoy it. Did you also know there is a manga version of Gail Carriger's Soulless in the works?